ALAN MANUFACTURING TERRAZO ATTACHMENT FOR FLOOR 17" FLOOR BUFFER. 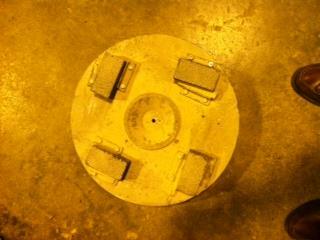 4 CONCRETE STONES ON BOTTOM OF DISC. * Please call us with any questions you may have about our floor terrazo attachment for 17 inch buffer in Kingsport TN, Johnson City, Elizabethton, Rogersville TN, Gate City VA and the NE Tennessee, SE Kentucky and SW Virginia Tri-State Area.